The first episode of Jay Leno’s 10:00 show aired tonight. Having the late night comedians begin at 10:00 reminds me of back in the 1990’s when E! ran reruns of Late Night with David Letterman at 10:00 after Letterman went to CBS to to The Late Show. The old Letterman reruns were better. I fear NBC might be in trouble. I wonder if they still own the rights to air the old Letterman or Carson reruns instead. I suggest that if Leno is going to make it in prime time he do something to really create some buzz. Perhaps he should tell a joke about one of Sarah Palin’s daughters. 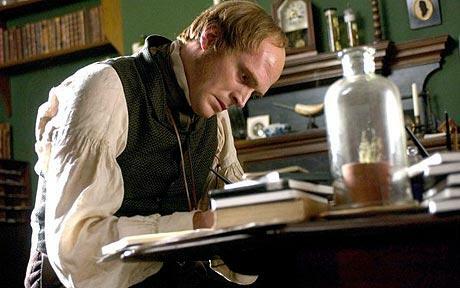 While recently Creation, the movie about the life of Charles Darwin seemed too controversial to be shown in the United States, there are reports this afternoon that some are now interested distributing it. A deal is anticipated by the end of the week. A trailer for the movie is posted above. Ironic, considering resistance from conservatives; the film was bankrolled by Mel Gibson’s Icon Productions which was also behind “The Passion of the Christ.” “Creation” follows the religious struggle of Darwin as he writes “On the Origin of the Species” and has been embraced by Christian groups in Great Britain. “You’ve killed God” says one of Darwin’s friends. You might think conservative church goers in the United States would line up to see the film – and they’d make a big audience: a recent Gallup poll showed only 39 percent of Americans surveyed believed in evolution. However, “conservative religious and the creationist groups have been so intense on demonizing Darwin that any film which shows him as a real human will likely be viewed as controversial,” director John Amiel tells Reuters. Such insiders point to theories running rampant on the Internet, such as the idea that Barack Obama was born in Kenya and is thus ineligible to be president, or that he is a communist, or that his allies want to set up Nazi-like detention camps for political opponents. Those theories, the insiders say, have stoked the GOP base and have created a “purist” climate in which a figure such as Rep. Joe Wilson (R-S.C.) is lionized for his “You lie!” outburst last week when Obama addressed Congress. They are “wild accusations and the paranoid delusions coming from the fever swamps,” said David Frum, a conservative author and speechwriter for President George W. Bush who is among the more vocal critics of the party base and of the conservative talk show hosts helping to fan the unrest. The article also discusses other related points which I, and other bloggers, have already been discussing, including the fringe influence of WorldNetDaily and the right wing smear campaign against Cass Sunstein.